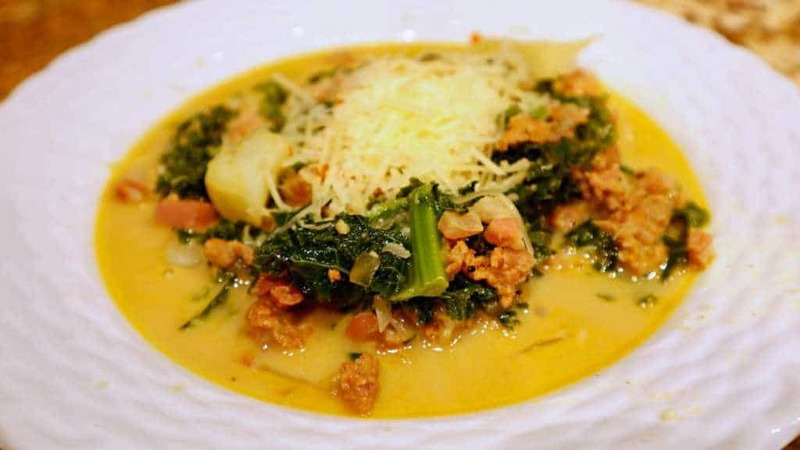 One of the best parts about going to Olive Garden is to get some of their Zuppa Toscana, but that just isn’t something you can have as-is when you are eating Keto. The good news is that with some minor adjustments to the recipe we can make a taste-alike version (that actually tastes better than the original) that is also Keto-friendly. Yes, it will include your favorite overused Keto ingredient, the friendly Cauliflower, and it is so worth it. 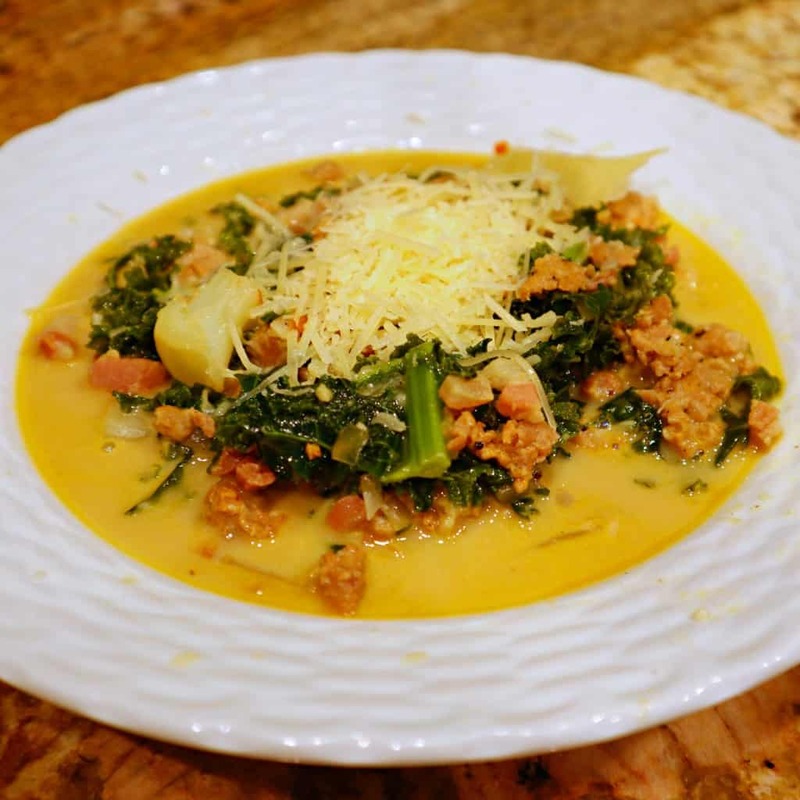 I like to make my Zuppa Toscana packed with even more ingredients than what they typically serve at Olive Garden, and part of the reason is that I eat this alone as a meal, and not accompanied with All-I-Can-Eat Soup, Salad, and Breadsticks. So since this is a much heartier soup, one nice heaping bowl should fill you up. For the Italian Sausage, I like to buy mine from the local butcher. They make them the old-fashioned way, with hand-cut pork trimmings, and animal casing. This also doesn’t have dextrose and some of the other nasties when I buy them this way. Some people will also choose to use Bacon instead of the Pancetta, but I like to make this with Pancetta. If you choose to make it with some smoked bacon, use about 4-5 slices as a substitution for the Pancetta, as that may cut some of the costs down a tiny bit. Additionally, instead of using Chicken Broth and Water as the liquids in my Keto Zuppa Toscana, I use Chicken Bone Broth instead. The Bone Broth is not only tastier, but there are some additional nutritional properties that you get from the Collagen and other components that break down during the creation of the Bone Broth. This makes the dish even tastier than when you get it from the restaurant. And can we take a minute to appreciate this soup? You won’t be fishing around your bowl for something other than broth with this one! Take 1 Pound of Spicy Italian Sausage (it just doesn’t taste the same with Sweet Italian Sausage), and remove it from it’s casing and put into the pot, along with 5 Ounces of Diced Pancetta (or Chopped Bacon if preferred). Saute the meats until the Italian Sausage is browned, and mince them up while cooking by using your spoon. Once the meats are browned, strain them out of the pot, leaving the grease behind. Place a whole Medium White Onion diced into the pot and coat in the greases from the meats. Allow to cook for 3-5 minutes until aromatic. Add in the Pressed Garlic to the Onions and season with the Salt and Pepper, book for about 1-2 minutes more. Add in the Chicken Bone Broth and Chopped Cauliflower stalks. Simmer on medium for 20-25 minutes, stirring at least a couple times during the process. Add the Chopped Kale, and allow to cook for 3 to 5 minutes to wilt the Kale a little bit. Add the Sausage and Pancetta back into the Pot, along with the Heavy Whipping Cream. Simmer for about 5 minutes more. 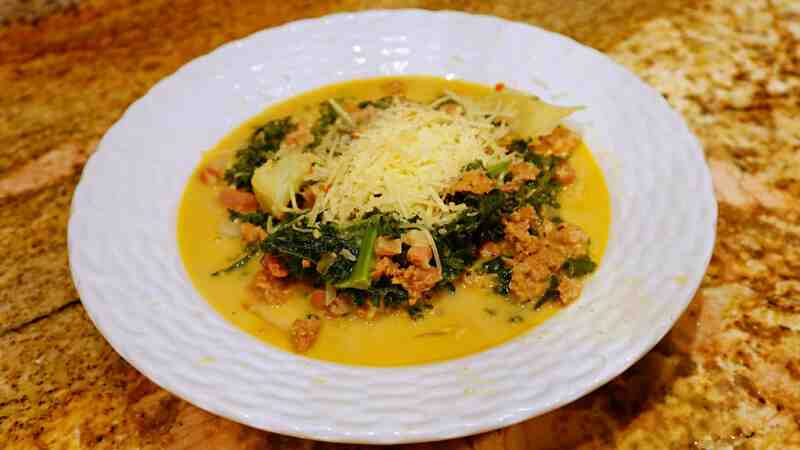 Serve right away for best results, and optionally top with shredded or grated Parmesan Cheese. Note: If you choose to refrigerate any leftovers, the Chicken Bone Broth and Heavy Whipping Cream with separate. I recommend reheating this on the stove to get the best tasting results for leftovers. You can store this in the refrigerator for at least 2 more days after making it. I made this last night, increasing some of the portions of ingredients. Very delicious! I used mild Italian sausage and added cayenne pepper. I just made this. It is DELICIOUS!!!!!!! I make this with turnips instead of potatoes. Turnips are good if you peel them down past the outer ring which is hot and sometimes bitter. But the dish is wonderful. we make this soup all the time, but I’d rather have the potatoes than the onions and garlic, onions especially are practically pure sugar. my family is allergic to the allium family which includes onions, garlic, and leeks. We’ve been substituting rutabaga for potatoes in most dishes which moderate success. Haven’t tried this soup yet but it’s next on our list. Made this today & added extra broth & spinach since I had it. Looks so good. Can’t wait to have a bowl! Came across this recipe on Facebook today and had my other half pick up the ingredients. He couldn’t find pancetta and bought prosciutto instead. Is this a good substitute? They are not the same meats, and Prosciutto is very aromatic. Delicious on it’s own, but I haven’t used it in this recipe and am not sure it would turn out quite the same. You could make the recipe without it if you really want. The sausage adds most of the flavor to the soup. If you can’t find pancetta, substitute bacon. That would just be a lot less chunky in texture if you do that. I think the stalks are just for simulating the feeling of a tender potato and not really for flavor. I made this using collard greens instead of kale because the collard greens were by far less carbs. I also used bacon and 1 cup of cauliflower rice. I thought it was delicious. And I got the serving size down to 2 net carbs! Thanks for the recipe! The cauliflower isn’t in the written instructions, can you please add it? This was great!!! I only had riced cauli, but was really good. I don’t miss potatoes anyway. Haha . Curious though do you have a rough estimate on the serving size? I think i have mine around 1.5-cups to come out with 8. I still track right now, so curious. Thanks! Making this tonight, it’s smells great! Can’t wait to try it out! I made this yesterday. I did have to make a few modification due to my mother’s salt restrictions and my dislike of fennel. This soup is wonderful. Full of flavor and veggies. Win Win I had planned to put half in the freezer for another day but after today, I will not have any leftovers. Made this today. Used turnips instead on cauliflower and it was amazing. The bone broth and sausage really favor this soup. This is a keeper.